Figure 1. Renormalization in QED: The simple electron-photon interaction that determines the electron's charge at one renormalization point is revealed to consist of more complicated interactions at another. In quantum field theory (QFT) and the statistical mechanics of fields, renormalization refers to a collection of techniques used to construct mathematical relationships or approximate relationships between observable quantities, when the standard assumption that the parameters of the theory are finite breaks down (giving the result that many observables are infinite). Renormalization arose in quantum electrodynamics as a means of making sense of the infinite results of various calculations and extracting finite answers to properly posed physical questions. Initially viewed as a suspect, provisional procedure by most of its originators, renormalization eventually was embraced as an important tool in several fields of physics, as a result of work in effective field theory and the renormalization group. Some of the problems and phenomena eventually addressed by renormalization actually appeared earlier in the classical electrodynamics of point particles in the 19th and early 20th century. When calculating the electromagnetic interactions of charged particles, one often ignores the back-reaction of a particle's own field upon itself. It was realized early on that such a treatment is incomplete, and some theorists explored the intriguing idea that an electron's inertial mass could be entirely due to the back-reaction. However, if the electron is assumed to be a point, the calculated value of this back-reaction diverges, essentially because of the singularity at the origin in the inverse-square law. One potential solution was to assume that the electron had a nonzero size, comparable to the number known as the classical electron radius, about 2.8 x 10-15m. Then, however, according to Henri Poincaré, the theory became inconsistent unless the electron possessed additional forces to hold it together internally against the repulsion of like charges. Today, the hypothesis of a classical electron radius might be seen as an early attempt at regularization. Attempts to deal with the back-reaction, such as the Abraham-Lorentz force, exhibited bizarre phenomena such as acausal "pre-acceleration", in which an electron would start moving shortly before a force was applied (Jackson 1998). This is because an extended rigid body, when struck, cannot maintain causal subluminal transmission of the impulse: the far end starts moving as soon as the near end is struck. If rigidity goes, the particle ceases to be fundamental since it has internal dynamics; but if subluminality or causality go, so does most of physics. In classical field theory, therefore, the contribution of field interactions to a particle's physical properties was already problematic. Indeed, in some ways, the trouble was worse than in QFT, since the short-distance divergences involved were typically stronger than the ones encountered in quantum theories. Figure 2. A diagram contributing to electron-electron scattering in QED. The loop has an ultraviolet divergence. When developing quantum electrodynamics in the 1940s, Shin'ichiro Tomonaga, Julian Schwinger, Richard Feynman, and Freeman Dyson discovered that, in perturbative calculations, problems with divergent integrals abounded. 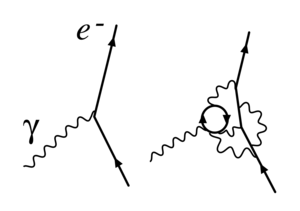 One way of describing the divergences in QED is that they appear as the consequence of calculations involving Feynman diagrams with closed loops of virtual particles in them. These diagrams appear in the perturbative approximation of quantum field theory. Each looped diagram represents a perturbation, or small correction, to a diagram without loops. Intuitively, diagrams with more and more loops should give smaller and smaller corrections to the values of diagrams which do not contain any loops. However, when the contributions of these loop diagrams are naively calculated, they become infinitely large. One type of loop would be a situation in which a virtual electron- positron pair appear out of the vacuum, interact with various photons, and then annihilate. Another would be an electron-photon interaction as in Figure 1. The diagram in Figure 2 shows one of the several one-loop contributions to electron-electron scattering in QED. The electron on the left side of the diagram, represented by the solid line, starts out with four-momentum pμ and ends up with four-momentum rμ. It emits a virtual photon carrying rμ − pμ to transfer energy and momentum to the other electron. But in this diagram, before that happens, it emits another virtual photon carrying four-momentum qμ, and it reabsorbs this one after emitting the other virtual photon. Energy and momentum conservation do not determine the four-momentum qμ uniquely, so all possibilities contribute equally and we must integrate. The various γμ factors in this expression are gamma matrices as in the covariant formulation of the Dirac equation; they have to do with the spin of the electron. The important part for our purposes is the dependency on qμ of the three big factors in the integrand, which are from the propagators of the two electron lines and the photon line in the loop. This integral is divergent, and infinite unless we cut it off at finite energy and momentum in some way. In order to make contact with reality, then, the formulae would have to be rewritten in terms of measurable, renormalized quantities. The charge of the electron, say, would be defined in terms of a quantity measured at a specific kinematic renormalization point or subtraction point (which will generally have a characteristic energy, called the renormalization scale or simply the energy scale). The parts of the Lagrangian left over, involving the remaining portions of the bare quantities, could then be reinterpreted as counterterms, involved in divergent diagrams exactly canceling out the troublesome divergences for other diagrams. The physical constant e, the electron's charge, can then be defined in terms of some specific experiment; we set the renormalization scale equal to the energy characteristic of this experiment, and the first term gives the interaction we see in the laboratory (up to small, finite corrections from loop diagrams, providing such exotica as the high-order corrections to the magnetic moment). The rest is the counterterm. If we are lucky, the divergent parts of loop diagrams can all be decomposed into pieces with three or fewer legs, with an algebraic form that can be canceled out by the second term (or by the similar counterterms that come from Z0 and Z3). In QED, we are lucky: the theory is renormalizable (see below for more on this). Colloquially, particle physicists often speak of certain physical constants as varying with the energy of an interaction, though in fact it is the renormalization scale that is the independent quantity. This running does, however, provide a convenient means of describing changes in the behaviour of a field theory under changes in the energies involved in an interaction. For example, since the coupling constant in quantum chromodynamics becomes small at large energy scales, the theory behaves more like a free theory as the energy exchanged in an interaction becomes large, a phenomenon known as asymptotic freedom. 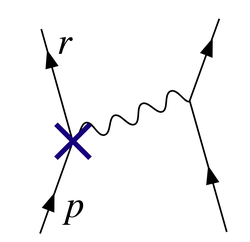 Choosing an increasing energy scale and using the renormalization group makes this clear from simple Feynman diagrams; were this not done, the prediction would be the same, but would arise from complicated high-order cancellations. Since the quantity is ill-defined, in order to make this notion of canceling divergences precise, the divergences first have to be tamed mathematically using the theory of limits, in a process known as regularization. Many different types of regulator are used in quantum field theory calculations, each with its advantages and disadvantages. One of the most popular in modern use is dimensional regularization, invented by Gerardus 't Hooft and Martinus J. G. Veltman, which tames the integrals by carrying them into a space with a fictitious fractional number of dimensions. Another is Pauli-Villars regularization, which adds fictitious particles to the theory with very large masses, such that loop integrands involving the massive particles cancel out the existing loops at large momenta. Yet another regularization scheme is the Lattice regularization, introduced by Kenneth Wilson, which pretends that our space-time is constructed by hyper-cubical lattice with fixed grid size. This size is a natural cutoff for the maximal momentum that a particle could possess when propagating on the lattice. And after doing calculation on several lattices with different grid size, the physical result is extrapolated to grid size 0, or our natural universe. This presupposes the existence of a scaling limit. valid when m>0, Here the Zeta function is Hurwitz zeta function and Beta is a positive real number. "Most physicists are very satisfied with the situation. They say: 'Quantum electrodynamics is a good theory and we do not have to worry about it any more.' I must say that I am very dissatisfied with the situation, because this so-called 'good theory' does involve neglecting infinities which appear in its equations, neglecting them in an arbitrary way. This is just not sensible mathematics. Sensible mathematics involves neglecting a quantity when it is small - not neglecting it just because it is infinitely great and you do not want it!" The general unease was almost universal in texts up to the 1970s and 1980s. Beginning in the 1970s, however, inspired by work on the renormalization group and effective field theory, and despite the fact that Dirac, Feynman and various others never withdrew their criticisms, attitudes began to change, especially among younger theorists. Kenneth G. Wilson and others demonstrated that the renormalization group is useful in statistical field theory applied to condensed matter physics, where it provides important insights into the behaviour of phase transitions. In condensed matter physics, a real short-distance regulator exists: matter ceases to be continuous on the scale of atoms. Short-distance divergences in condensed matter physics do not present a philosophical problem, since the field theory is only an effective, smoothed-out representation of the behaviour of matter anyway; there are no infinities since the cutoff is actually always finite, and it makes perfect sense that the bare quantities are cutoff-dependent. If QFT holds all the way down past the Planck length (where it might yield to "string theory" or something different), then there may be no real problem with short-distance divergences in particle physics either; all field theories could simply be effective field theories. In a sense, this approach echoes the older attitude that the divergences in QFT speak of human ignorance about the workings of nature, but also acknowledges that this ignorance can be quantified and that the resulting effective theories remain useful. In QFT, the value of a physical constant, in general, depends on the scale that one chooses as the renormalization point, and it becomes very interesting to examine the renormalization group running of physical constants under changes in the energy scale. The coupling constants in the Standard Model of particle physics vary in different ways with increasing energy scale: the coupling of quantum chromodynamics and the weak isospin coupling of the electroweak force tend to decrease, and the weak hypercharge coupling of the electroweak force tends to increase. At the colossal energy scale of 1015 GeV (far beyond the reach of our civilization's particle accelerators), they all become approximately the same size (Grotz and Klapdor 1990, p. 254), a major motivation for speculations about grand unified theory. Instead of a worrisome problem, renormalization has become an important theoretical tool for studying the behaviour of field theories in different regimes. From this philosophical reassessment a new concept follows naturally: the notion of renormalizability. Not all theories lend themselves to renormalization in the manner described above, with a finite supply of counterterms and all quantities becoming cutoff-independent at the end of the calculation. If the Lagrangian contains combinations of field operators of excessively high dimension in energy units, the counterterms required to cancel all divergences proliferate to infinite number, and, at first glance, the theory would seem to gain an infinite number of free parameters and therefore lose all predictive power, becoming scientifically worthless. Such theories are called nonrenormalizable. 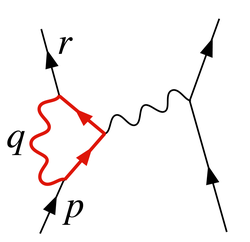 The Standard Model of particle physics contains only renormalizable operators, but the interactions of general relativity become nonrenormalizable operators if one attempts to construct a field theory of quantum gravity in the most straightforward manner, suggesting that perturbation theory is useless in application to quantum gravity. However, in an effective field theory, "renormalizability" is, strictly speaking, a misnomer. In a nonrenormalizable effective field theory, terms in the Lagrangian do multiply to infinity, but have coefficients suppressed by ever-more-extreme inverse powers of the energy cutoff. If the cutoff is a real, physical quantity—if, that is, the theory is only an effective description of physics up to some maximum energy or minimum distance scale—then these extra terms could represent real physical interactions. Assuming that the dimensionless constants in the theory do not get too large, one can group calculations by inverse powers of the cutoff, and extract approximate predictions to finite order in the cutoff that still have a finite number of free parameters. It can even be useful to renormalize these "nonrenormalizable" interactions.